I am not a big fan of broadcast or cable TV, hence I have never felt a big need to own a large television. However, I do enjoy movies. My roommate in graduate school had a large Zenith professional front-projection TV that first introduced me to home theater (I believe it was with The Terminator). For a while I have thought about setting up my own home theater, but lacked the budget for the centerpiece, the projector. I finally came across an article on building your own, which has turned out to be a very inexpensive way to try out what it would look like and help me evaluate the size, brightness and contrast ratio I would need. Below are some pictures of the setup I put together. I bought a used Viewsonic VG-series flat panel off eBay for about $120. This was a 14" 1024x768 resolution model. Higher resolutions and screen sizes are available, but DVDs only have 480 scan lines (vertical resolution) by 540 lines (about 960 pixels horizontal for a 16:9 movie), so higher resolution on the LCD would not have helped. If I was using HD video content, the pictures would be higher resolution in which case I would want the higher resolution monitor. The diagonal on the overhead projector I used was only 14", so a larger LCD would have been wasted. The VG-series is for graphics professionals, so I was hoping to get better color accuracy and a higher contrast ratio than with a cheaper display (and there were many for sale on eBay for half the cost of this one). This picture is with the rear panel taken off. Same picture as above, but monitor flipped around. The normal viewing side is down on the table, base (removed) toward the top of the picture. 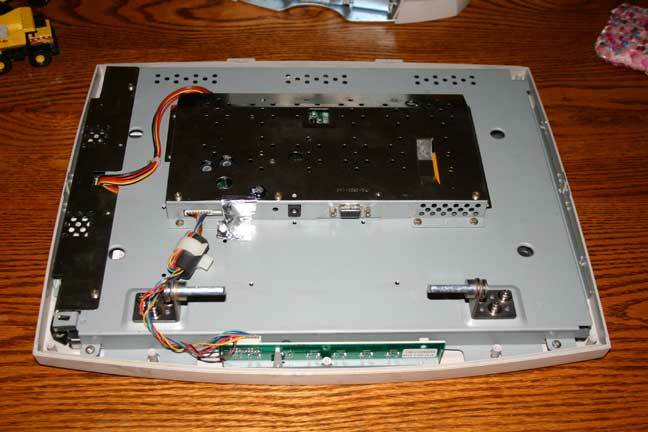 The job here is to remove the actual LCD panel, plus all the image processing electronics. The case, shielding and backlight will be thrown away. 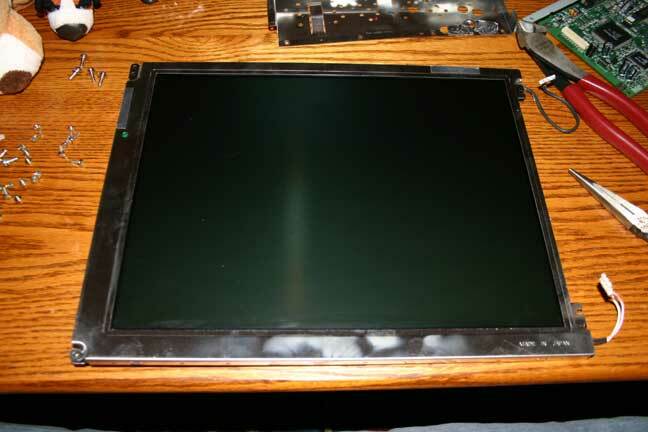 View of the front of the monitor after removing the casing and electronics. 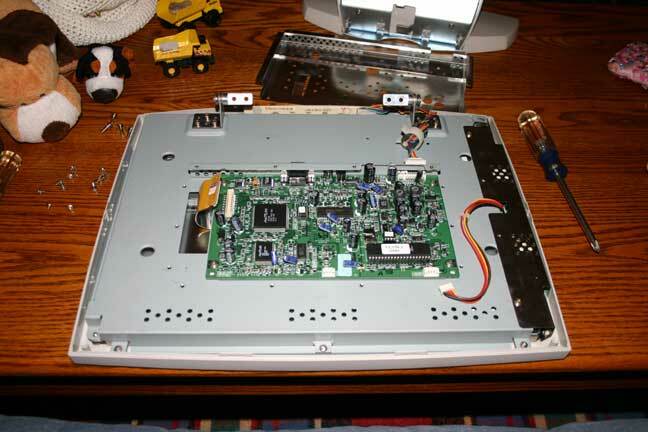 The electronics will be attached again later after the rest of the screen is disassembled. This is the back of the screen. 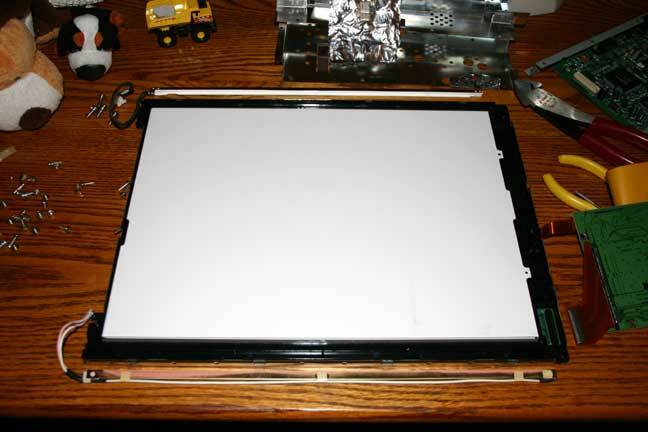 An LCD flat-panel display is basically an LCD panel with a light behind it. When the light is on, the LCD blocks part of the light to create an image. In this picture the light has been removed, and you can see some of the difusers used between the light and the screen to even out the illumination. 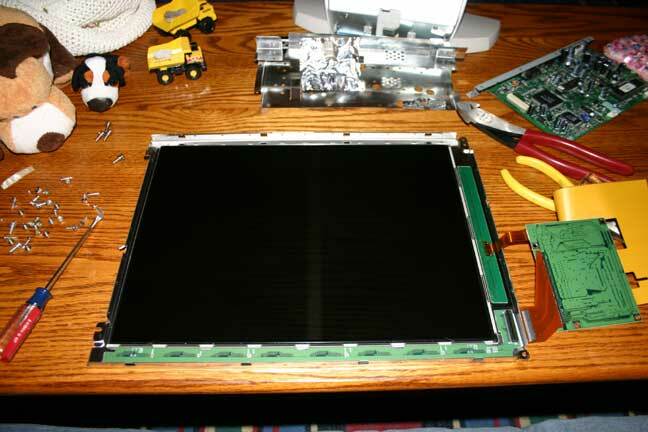 This is the raw LCD panel with the electronics that were not able to be removed easily. There are many delicate connections around the perimeter for the individual pixels in the panel. For my light source, I got a free overhead projector from my office (they were throwing them away). In this case, a 3M 910. This is a 2750 lumen projector, which is quite bright compared to many home theater projectors available on the market today. SMPTE recommends 12 ft-Lamberts (ANSI lumens/screen area) for home theater, but this setup will yield (on first-approximation) over 90 ft-Lamberts with a 100" diaganol. 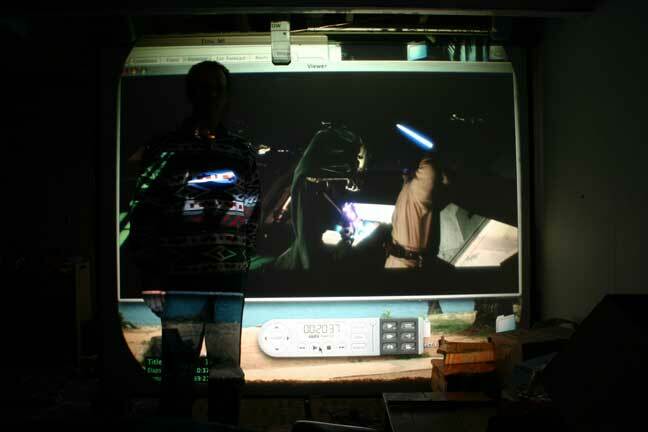 The general plan was to replace the backlight that came with the LCD panel with the light from the projector, then focus the image using the projector's optics. 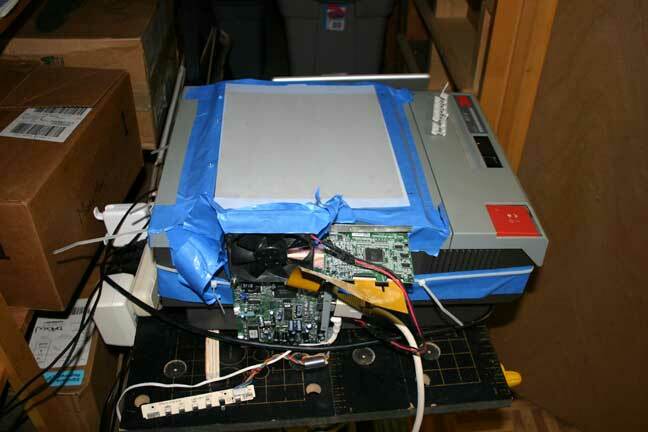 In this picture, you can see the LCD panel taped on top of the projector (a translucent white plastic cover is protecting the screen). The electronics look horrible, but are in the only place that all the cables would still hook up. 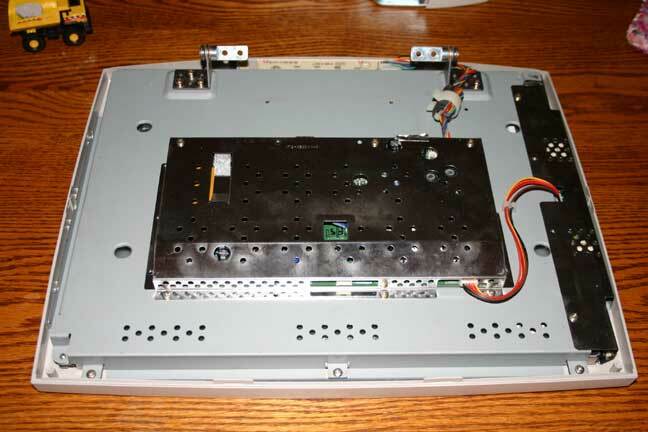 Note the 12V fan used to cool the panel (another freebee from my office). The panel is actually about 1/2" above the projector, and the fan has a cowling made of tape (blue) to channel cooling air under the panel. This is a must, as the LCD will be absorbing a large chunk of the light and heat output of the projector, which will kill it quickly! Side view of the electronics. Note the monitor control buttons sitting on the table. These are used to turn the LCD on and off still. 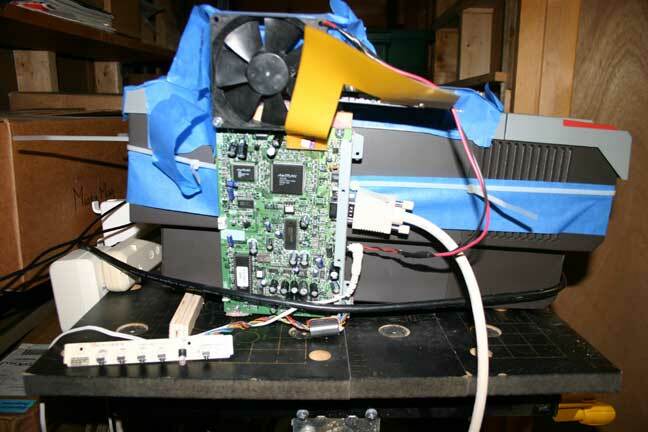 I needed to buy a 12V power supply to run the screen and fan, which cost $20 at Radio Shack. This raised the cost of the projector to about $140. Here you can see the LCD in action. Star Wars III (Revenge of the Sith) is playing on the laptop, which is using the external monitor hookup to drive the LCD. The projector itself is in a small closet behind the room with the screen, and projects through the wall. This is because the projector is quite loud when running due to the internal cooling fan. A future upgrade is to use an old Pismo Powerbook given to me to drive the system, instead of hooking my "good" Powerbook up to the projector every time I want to watch something. The Pismo has something broken, so this will add more cost to the project to repair. 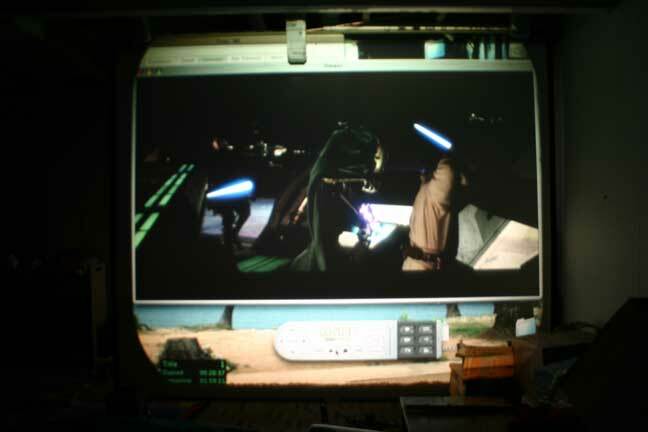 Screen shot of the system (General Grevious battling Obi-Wan and Anikan in the opening sequence). Sorry about the blurry image -- I probably wobbled the camera during the time-exposure required for this picture. The screen is a DaLite that I got free from my office (again, they were throwing stuff away). The block at the top is the center channel speaker (which isn't very centered at the moment). The movie is not running in full-screen mode so you can get an idea of how big the image is. Most of my movies are Widescreen, so the top and bottom of the screen are black and you don't notice the center-channel speaker. This is me standing in front of the screen (I'm 6'2"). The image when set to full screen is about 100"diaganol, which will put most home theatres to shame! This is the largest image I can project on my free screen. The 2750 lumens looks quite good when the lights are off in the room. Surround Sound system: $400 Yahama setup from Best Buy with 5.1 processor/amp and speakers. General impression: very nice for what I paid. There is a lot of brightness uniformity issues with an overhead projector, so my movies are much brighter in the middle than toward the edges. You can also see the rings of the Fresnel lens used in the projector's optics when projecting a pure white image, so I know they are in the video as well (but generally not visible). 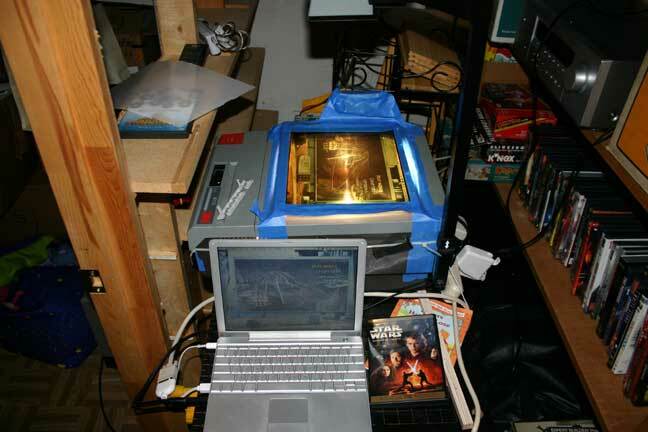 This setup is quite noisy due to the fan built into the overhead projector, which I can do little about. Overall, very nice for what I paid, however I would look forward to a real home projector once the HD-DVD people figure out the format, resolution and interface issues.